Update: *This 7/31 memo was voided by the US Consulate on 8/1 p.m. One parent has the option to depart from China after seeing their child and finalizing their adoption, and still have their child receive an IR-3 Visa as long as one parent is present for the Visa process. Couples adopting from China may now want to consider having both parents stay in China for the entire adoption trip. According to a new United States Consulate directive, both parents must attend the Consulate appointment in order for their new child to automatically become a US citizen. In a memo addressed to adoption agencies today, the US Consulate announced the Adopted Child Immigrant Visa Unit will no longer issue IR-3 visas for children whose parents do not participate in the final oath-taking ceremony in Guangzhou. With an IR-3 Visa, the adopted child becomes a U.S. citizen the moment they touchdown on US soil. With the new regulations, if one parent forgoes travel or returns to the States prior to the Visa issuance, their adopted child will come home on an IR4 Visa, which requires re-adoption and application for US citizenship. These extra steps will create additional paperwork and fees paid by the family. 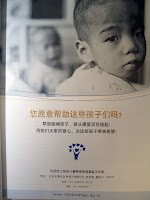 “This is important information to consider when families decide if both parents will travel for the entire adoption trip within China,” says Tollefson. St. Louis- Dr. Vu Duc Long, Director of the Department of International Adoption (DIA), and Mr. Dang Minh Dao, legal expert for the DIA overseeing adoptions to the US, made Children’s Hope their first stop in their American tour. Thursday evening, Children’s Hope families who adopted from Vietnam attended a Children’s Hope reception for these two top adoption officials. The twenty-five families in attendance showed off their adopted children and heard the two men praise Children’s Hope Vietnam adoption program. Friday, the Children’s Hope development/sponsorship team met with the delegation to explain current and projected development aid projects in Vietnam in addition to working at establishing a strong orphan sponsorship program. Although Children’s Hope was their first stop while in the US, Dr. Long and Mr. Dao will visit one other adoption agency before meeting with adoption officials in Washington D.C.
Caption: Children who were adopted from Vietnam gather around Mr. Dao, on the left holding a child, and Dr. Long, in the light yellow short-sleeve shirt, at Children’s Hope home office in St. Louis. To share in the Stacie and Kevin's Referral Day joy, push play below. A series of firsts brings excitement to all! Behind the scenes, Ethiopia Program Director Sharon Turner and Adoption Social Worker Erin Tilley were elated for Children's Hope first family for Ethiopia. After patiently waiting for Children’s Hope Ethiopia licensure, Kevin and Stacie submitted their adoption paperwork and received the referral for their beautiful healthy boy just one month later. 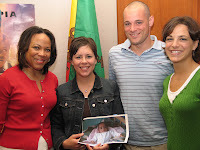 Today in the Ethiopia courts, Kevin and Stacie's adoption became official! His name is Yabsira, “work of God the Father”. The new parents will travel in three to four weeks to meet their adoptive son and bring him home to Missouri, where they will rename him Micah Yabsira. Congratulations to our first family! In the last few weeks, Children's Hope has received two additional referrals for our first pioneer families, one for a sibling group of a 2-month-old boy and a 2½-year-old girl, and the second for a 3-month-old baby boy. These children are receiving direct care in Children's Hope transition home, House of Hope, while the families wait for adoption approval in court and their travel dates. As courts finalize these pioneer family adoptions, their happy photos will be shared! Children's Hope families will continue to receive referrals while Ethiopian courts break beginning August 5. The courts will remain closed for 3-12 weeks. Caption: On their referral day, a photo of son Yabsira stands in for the family’s first photo opportunity, with Program Director Sharon Turner and family adoption social worker Erin Tilley by their side. Success! Nearly 1200 parents and children reunited this past Saturday for Children's Hope 15th Reunion Picnic in St. Louis. By plane, by train, or by car, families from 26 states came together, some for their first time and some as repeat attendees of the annual reunion. One little girl from China came hoping to get her first glimpse of a Chinese boy. Others were just pleased to make snow out of packing foam peanuts in blow up swim pools. Still others were happy to laugh at performing act Babaloo's stinky feet songs. But all went away having refreshed old friendships they never knew they'd make through adoption and many made new friends they hope to see again next year or before. We hope to see you next year, too! Thanks for making the 2007 reunion a blast! Post updated on 12/18/07; www.stltoday.com article link removed as no longer active. Margaret Fleming is the mother of twelve children, nine of whom were adopted. Her last five children were born HIV-positive. Margaret is the mother of two children adopted from Vietnam through Children’s Hope; her daughter Lanh, brought home in April 2006 is also HIV-positive. Watch ABC7's video as she brings home her ninth adopted child from Ethiopia on the 4th of July and find out what motivates this inspirational mom. “This was my first mission trip. Many people told me before leaving, ‘You’ll probably get more out of it than you will give.’ Those people were absolutely right,” says Toni. Toni Lynch, an integral member of Children’s Hope China Team, spent the last three weeks in the heart of Ethiopia, aiding lepers and the HIV-positive community—and then working to open Children’s Hope transition home “House of Hope”. See how both the love and poverty of Ethiopia has changed Toni and left her forever altered in the awareness of a third world country reality. Read her letter to friends, family and now you, here.